December 27, 2015 By Joe H.
The building and operating of the trains at the Manassas Candy Factory is a team effort. Much planning goes into the setup months before hand. What can we do different? What radius of train will fit where? Where should the Standard gauge table top layout go? Setup occurred Monday afternoon with 15 NCTers on hand. Lots of pushing and sliding of modules, measurements and calculating the fits. Team effort completely. Changes were made and wiring adjusted. Tuesday was tweak day if anything needed it. Wednesday at 5pm we were up and running for a marvelous 5 day run of playing trains at the old Manassas Candy Factory. The squall of a little boy and his sister every time the old Lionel gateman comes out of his shack will carry my heart a long way over the next snowy winter months. The little baby held close to mommy seems to respond to the clatter on the rails. Frank’s candy factory disgorging 1800 M&M’s one at a time to the thrill of the kids…will lay sweet on my mind, particularly this year when none of my kids are home here. A two year old had so much excitement touching a huge standard gauge car in front of him. I asked if he wanted to help me put some trains on the track. I partially opened the train box on the floor and the closed it with a snap and hollered “OH Trains!” the little fella jumped back, then grabbed the top and tossed it across the floor and pulled out a passenger car with both hands. Momma gasped… not to worry sez I; this is gonna work. The boy got the car on top of the track but struggled, as we all do, with the sloppy flex-trucks of American Flyer standard gauge. The train was built in 1926, the second year after AF tried to break into the standard gauge market. Those trucks don’t like to set right on the tracks. Momma reached down to help her son set the car straight and between them, the consist was all on the track and they are hooked on the toys I say! Many times as the kids ran everywhere, I asked the parents who was gonna nap this afternoon. ALL parents hoped they could, along with the kids. Merry Christmas everyone. It seems Santa was away visiting our men and women in harms way. May be next year, I pray, we will have peace in the world and safe travels for Santa. For an unknown reason a full size fako steam loco rolled up outside the Candy Factory. I hear it is on eBay and can be yours. It was made of plywood, drain and water pipes canvas, and imagination. I loved it. A young girl was reaching to touch a train on the inside loop and her Mother reached to grab her hand. At that moment the AF night flyer was ahead of schedule and rumbled past. Two trains can’t operate in the same place at the same time. The wreck was a glorious scattering of tin. No damage done and schedules were met OT. STOMPER and his trailer “The Verdant Detector.” Hope Danielson witnessed the detector detent verdantcy so the show was TCA approved.) (Late Christmas Eve did you see the silhouette of STOMPER passing the full moon? He was the Middle East flying top cover for Santa who was delivering presents and love to the believers who still reside there. Orange Suede whose Lionel #402 loco was caught smoking. Everyone knows an electric loco don’t smoke! Chromed repro #51 hauling 2 X 29 day coaches, one of which my Mother and I painted 70 years ago. Sequestration (AKA magic train) wowed the crowd with his ability to change from a rusty consist to a perfectly finished train at the flick of my hand. Hope’s Lionel #8 and 2 olive pax cars. Ed’s Beavers’ 2 X Classic trains’ steamers and McCoy freights. Ed drove 94 miles each way to Manassas to set up the layout on Monday and again on Sunday to play trains and takedown his track. That’s dedication! Thanks Ed! Lionel 390E with 310/312 pea green consist. Big Brass, who is set up for and pulled the AF set. He melted his e-unit during the pull. Tubby ran with a short consist. He draws very little power and is made of Tupperware parts and a Classic Trains’ motor. Green over orange local trolley powered by a KTM motor. Carl’s double headed Lionel 384’s in Christmas sets. A beaut! Jim Gray’s 611 set flew around the O gauge layout to the delight of Thomas, Dennis Gill’s son, had been asking for a 611 sighting at the show. We all experienced a wonderful time for us and the 2141 visitors we had to the Winter Wonderland event at the Manassas Candy Factory, 2015. 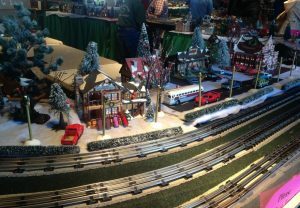 December 24, 2015 By Joe H.
Once again the Manassas Center for the Arts (aka The Candy Factory) was the venue for the Winter Wonderland train show. In past years we managed to have the show coincide with the VRE Santa Express trains but this year, due to a scheduling conflict, our show was a week later than normal. We were concerned attendance would be impacted but our fears were unwarranted. At the end of the show the building guard had tallied a total of 2141 people making the effort to stop by and enjoy our trains while supporting the local charity (SERVE) with food and monetary donations. This year’s layout had several firsts for both the show and Trackers. Our layout design accommodated 30 modules and 8 corners while leaving room for a sizeable 10X22 foot Standard Gauge layout. The final design was U shape with the standard Gauge tabletop layout in the middle. A real surrounded by trains’ effect for spectators. We also used the new graduated leg set to produce a down and under section to the delight of everyone. On the technical side we successfully tested the new MTH DCS Wi-Fi hardware and were running our trains from both smart phones and IPADS. A few issues were noted. The programing or loading train info needs to be refined, especially for our modular operations. The data load seems to get confused. There was also a question of battery life for cell phones. Is continuous use an issue, no doubt this will be dependent on the phone model or type. Justin’s 6 track modules performed perfectly. The configuration sports 3 main tracks plus 3 passing sidings, all interchangeable. All switch function is cleverly controlled by a smart phone via a Wi-Fi connection. A very innovative design along with 1st class construction. The only drawback is the total length of the module set, 16 feet (4 modules). Additional 6 track modules are needed to increase the overall length by a minimum of 18-20 feet. A worthwhile project! The layout performed as expected with no major issues. The Programming track tether, the one broken for some time, was replaced. With the continuing monitoring efforts of Bill Creech and Bear Bailey trains usually filled our three tracks. Typically each track supported at least two trains and occasionally 3 trains. A difficult task to say the least, at times it seemed like herding cats! The Winter Wonderland theme was over the top this year. Every tracker out did themselves in both quantity and quality of detailed winter scenes. A marching band, red birds on telephone lines and deer on a mountain side for starters. Every module had their own winter theme and it didn’t go unnoticed by all the visitors and trackers alike. A much deserved (Nicely done) for everyone in the show. Many thanks to Ed Beaver for supporting the Standard Gauge layout this year by providing the track, trains and manpower for setup and takedown of the layout. His efforts are truly appreciated by everyone especially the trackmaster. Clem participated on both efforts along with trains and operational support just about every day. Thanks to Ed’s brother Norman and Harold for manning the layout on Saturday. The trolley and handcar combination was fascinating. Sunday was very special. Clem and Ed were joined by George and Carl along with their new Standard Gauge engines and consists. At one point in time a red double headed train was zipping round one loop while another train paced it on a separate loop. Of course all this took place with seven O gauge trains here and there on three sides of the layout. A surrounded by Trains effect in spades. Heads were on swivels!! Chicken soup, Chili and cornbread, Sausage and Egg Casserole, Pasta and meat sauce, Sandwiches, Cake, Cookies, Brownies, Apple Crisp, Fruit, sodas and water. We didn’t go hungry. Many thanks to everyone who contributed to the feast. A special thanks to everyone that supported the 2015 Candy Factory show, especially the participants. A great show only happens because of the tremendous effort of our members. 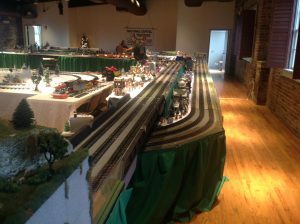 December 17, 2015 By Joe H.
The Team set up the layout on 8 December 2015 and ran trains on Wednesday 9 December. We had 11 Modules plus the Geezer Gate from the Md trailer. We used four foot corners with all 072 curves and had the entire layout set for a 31.5” rail height. We decorated with a variety of toys and buildings with winter and Christmas featured on most of the modules. We completed the layout early Wednesday morning and started running trains by 0830. The first class of students arrived at 0900. The audience included children from the ages of 3 thru 8 plus teachers and school staff. Between 0900 and 1445 we had 832 students visit the layout. We started removing the layout 3 PM and were gone by 4:30. The school Principal and the CEO of Eagle Academy PCS attended and were very pleased with how the show went. We have been asked to plan a larger layout for next November. It would be a two day show. We have also been asked to try and provide a show at their second campus which has 129 students. If we can arrange it, that show will be in January or February. Check the website for photos and a video of the show. November 29, 2015 By Joe H.
All Aboard! 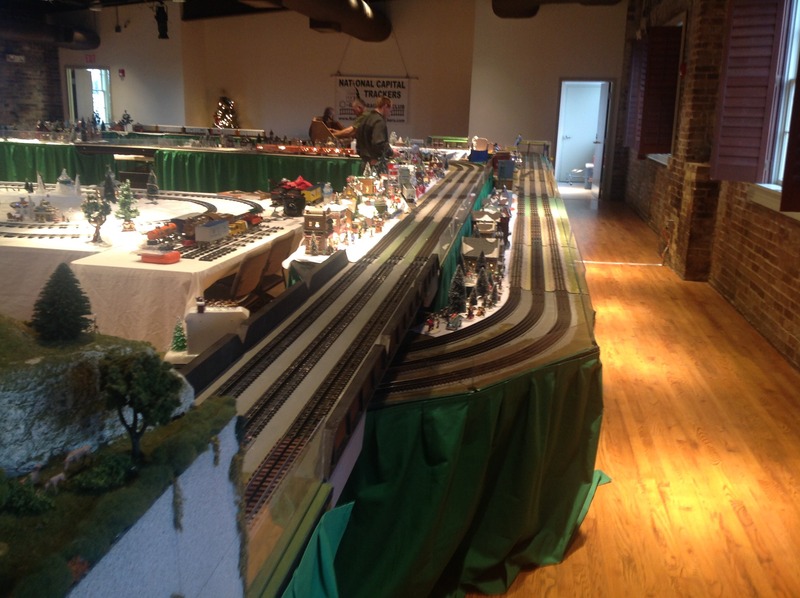 On April 9th, the National Capitol Trackers “O-Gauge Train Club” transformed our Scott Community Center into an interactive train display. The trains included electric, and diesel engines from the early 20th century to modern day chugging down the track. Setup began at 8:00 am and was completed by 10:00 am with the exception of two modules. Modules that contain two train tracks and are all built to the same specification so that they readily interconnect. 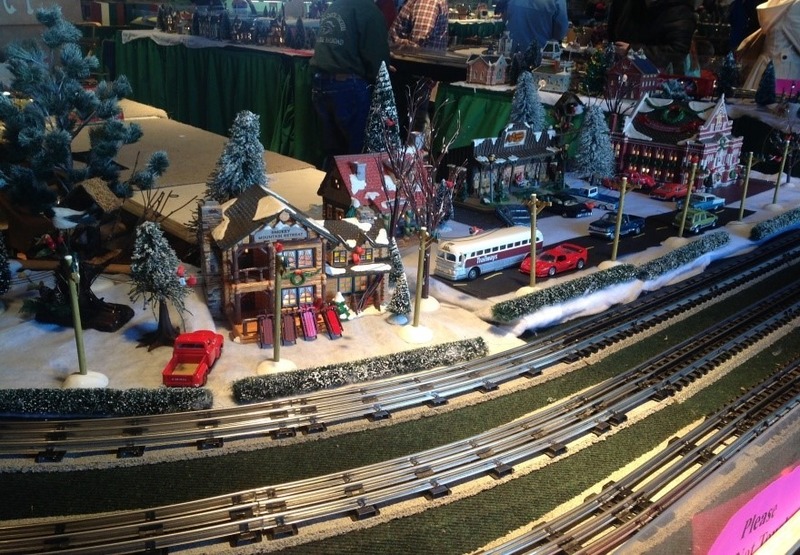 The residents were all excited about how lovely and well organized the train display appeared. Some even expressed to the club members their childhood memories of collecting trains. It was also exciting to learn about the history of each train and the members who built them. Special thanks to National Capitol Trackers “O- Gauge Train Club” for making this a day to remember. November 28, 2015 By Joe H.
November 23, 2015 By Joe H.